Vocolot, the Bay Area a cappella ensemble with universal heart and Jewish soul, celebrates 25 years of musical activism with a new album, Vocolot at 25, and a reunion concert at the Freight, bringing together for the first time many of the group’s past members, including jazz vocalist Ellen Robinson, Los Angeles-based singer Alison Lewis, Rabbi Rosalind Glazer, Cantor Felicia Sloin, and former Beach Blanket Babylonian, Jennifer Karno, along with the current edition of the group, featuring co-founder Linda Hirschhorn, Liz Stuart, Shana Levy, and Talia Cooper. Singing in English, Yiddish, Arabic, and Hebrew, as well as in Ladino, a language spoken by many Sephardic Jews, Vocolot blends lush harmonies with complex rhythms in original songs and arrangements of traditional texts that deliver a message of peace, reconciliation, and social justice. “Vocolot's performance at the International Jewish Music Festival in Amsterdam was spectacular,” said Grammy award winning trumpeter Frank London of the Klezmatics. 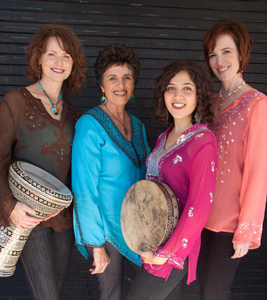 “I got goose bumps!” If you’re in the mood for goose bumps, gorgeous harmonies, and uplifting music rooted in Jewish traditions from around the world, enjoy an evening with Vocolot at the Freight.